A Keg Steakhouse + Bar Gift Card is the perfect way to satisfy any appetite. Treat someone special to our legendary Keg steaks, comfortable atmosphere and outstanding service. With more than 100 Keg locations in Canada and the United States, you can send a Keg Gift Card to be enjoyed across North America. Order bulk The Keg Steakhouse gift cards from National Gift Card Canada today! 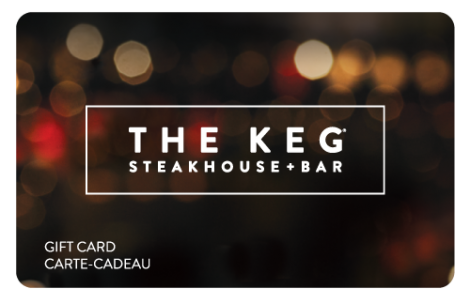 Present this card as payment at any participating Keg Steakhouse + Bar® restaurant across North America. Please protect your card as you would cash. Lost, stolen or cards used without your authorization cannot be replaced or replenished. This card cannot be redeemed for cash and no change will be given except as required by law.